I was at Warren Dunes State Park, rustickly camping with my kids over the last couple of days, and my monkey mind kept edging over to the radioactive leak that occurred at the Palisades Nuclear Power Plant, atrociously situated 36 measly miles south of where my kids were happily swimming. This marvel of Space-Age Science is 42 years old, it was scheduled to be decommissioned in 2007, but they gave ’em another 20 years to try to kill us all, just for the heck of it. …I have to ask, just precisely what the hell is wrong with us human beings that we can be convinced to take such awful, stupid, catastrophic risks? This leak was of ostensibly less than 80 gallons of ostensibly minimally radioactive water, which is more of a warning shot than we probably deserve, but the sleazebags corporate geniuses of Entergy, working hand in hand with our government’s highly effective except when they’re not Nuclear Regulatory Commission had the plant back online again in just 22 days. Here in Michigan, we’re cozied up next to 21% of ALL THE FRESH WATER IN THE WORLD, and as such, you’d almost think we had some kind of responsibility to, you know, protect it. Why do we allow these profiteering corporations to endanger our future like this? -if it’s OK by her it’s OK by me. 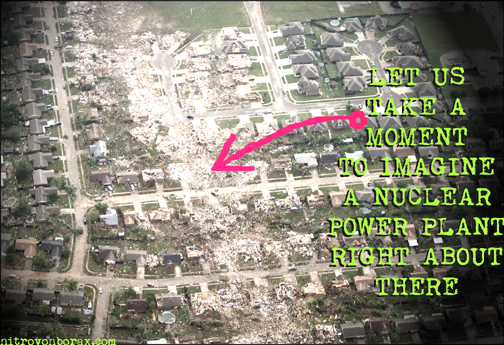 Fukushima was yet another great warning shot for us here in Michigan. More than 2 years- more than two and a half years- after the Fukushima nuclear plant blew up and melted down repeatedly, about a hundred thousand gallons of radioactive water continues to be generated daily and “stored,” by which I mean freely leaking, into the Pacific while the scumbags corporate geniuses of TEPCO completely fail to get the situation under control. The latest plan is to build some kind of a giant magic sno-cone machine that can freeze the ground around and down to a depth of 90 feet below the plant. Maybe by like 2015. Tell me again how cheap nuclear energy is, Japan. But the chances of an earthquake resulting in core damage at Palisades are just 1 in 156,250. That’s more than 100 times better odds than the Powerball lottery that we might permanently contaminate 21% of the fresh water that everybody on our planet needs, that we might never, never swim in our beautiful lake again, that we’ve willfully, selfishly chosen to make a stupid mistake that untold generation upon generations of our children will curse us for, as they die lingering deaths from radiation poisoning. That’s understatement, that last paragraph. Also you will please note that those are only the earthquake odds. LOTS of other catastrophic events are possible besides earthquakes. For just one more instance, I have also heard of these things called “tornadoes“, which are reputed to cause some damage to things in their path. 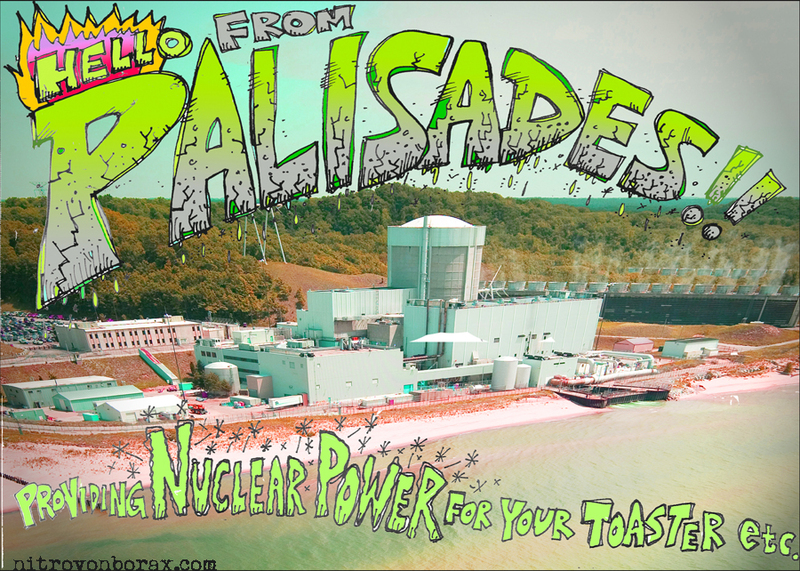 The spent fuel rods at Palisades were never sent to some tectonically-secure place for permanent storage. They sit, seething with evil, in warehouses around the Palisades nuclear plant, like some kind of gift-wrapped present for “terrorists,*” just like they’re piling up at nuclear power plants all across the United States. Like Michigan’s Cook Power Plant, which was only 3 miles north of where my kids were swimming. Like Michigan’s Fermi Power Plant, over on Lake Erie, where we don’t swim because of different decisions made by other scumbags corporate geniuses. Close them down. Pack up the fuel rods and get them the hell away from our water. Contact the corporate stooge Governor. Contact the power plant owners. Protest. Fight. F*ck them up -metaphorically- because even though the money-worshipping death cult could be poised to poison our lakes for hundreds of thousands of years it’s necessary to stay cleanly on the side of peaceful promotion of human life and our planet’s continued existence. Next Golden Rice: Lifesaver for Monsanto Agenda?